Click here to visit our page at the Eventbrite website. There, you'll be able to secure a digging role, or a support role, on the dig itself in May/June 2019. If you have any questions about the event, please contact organiser Robert McPhail at sonamarg@btinternet.com or 01880 820643. If you're not familiar with Eventbrite, and would prefer just to print out a booking form (which you can complete in pen, and return to Robert by hand, post, or e-mail), simply click here, and the form will either open for you in a new tab or download automatically. Click here to see our current provisional programme. The programme will open in a new tab. NOT NEW, BUT AN OLD FAVOURITE! You can donate to our Castle Of Kings project by text message (SMS) on your mobile phone. 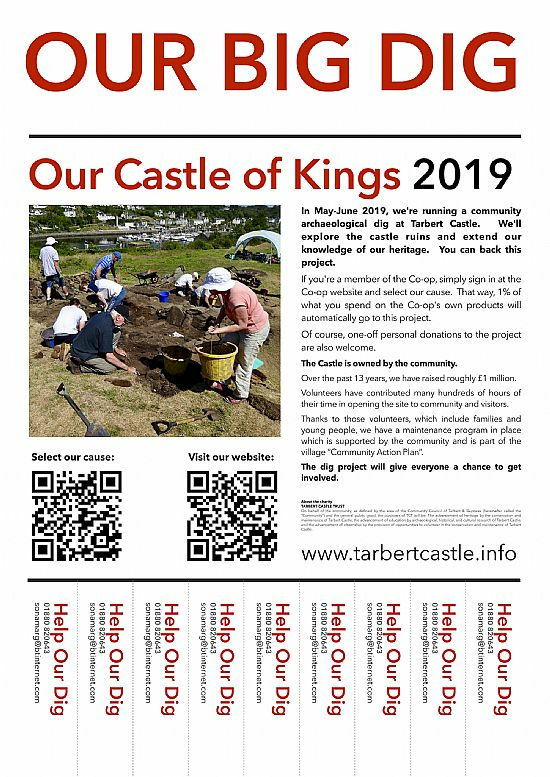 The Royal Castle of Tarbert is "a scheduled monument of national importance", community-owned since 2004, and now a heritage park, open to the public, 24 hours a day and 7 days a week. Over the intervening years, some £1m has been donated or sourced from numerous grant-giving organisations which, together with many hundreds of hours of volunteer time, has been invested in consolidating the ruins, clearing the site, interpreting the structures, and opening up public access. Volunteers, including families and young people, have a maintenance programme in place, with regular working parties supported by the community and part of the village community plan. In 2013, a detailed desk-based historical investigation and non-invasive survey of the monument was carried out, guided by archaeologist Roderick Regan, with the participation of community volunteers. This documented evidence forms the basis of the current proposals for further archaeological investigation. Over the weekend 30 June - 1 July 2018, a party of volunteers, led, trained, and supervised by Roderick Regan, carried out a preliminary dig on recreational land at Bruce Hill, adjacent to the castle grounds, for the purpose of investigating ancient occupation of the area around the castle. After the dig, Roderick Regan compiled a community excavation report, detailing the action taken and the results achieved.